I am putting this sausage in the Venison category because I think it fits best here, but I initially made this Spanish-style sausage with goat meat. 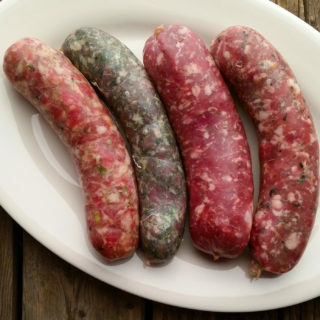 Naturally, the closest analog to goat in the wild game world is antelope, but I would happily make this paprika-heavy fresh sausage with venison or even wild boar or pork. These links are dominated by the flavors of paprika and rosemary, with a little undercurrent of allspice and onion. You could use shallots in place of the green onion, and if you wanted to you could add a little garlic — but not too much, as these are not supposed to be garlicky sausages. Chop meat (and pork fat, if using) into 1 inch chunks. Take out half the black pepper. Why? You’ll want to add them right before you do that final mix. This keeps the spices larger, altering the sausage’s texture, making eating it more interesting. Combine the salt, the rest of the pepper, herbs, spices and green onions with the meat, mix well with your hands and let it rest in the fridge for about an hour. Put the mixture back in the freezer for another 30 minutes and then grind again with the fine die on the meat grinder. This will give you a more refined texture and will minimize any gristly bits. Add the rest of the black pepper, the wine and vinegar, then mix thoroughly either using a Kitchenaid on low for 60-90 seconds or with your (very clean) hands. 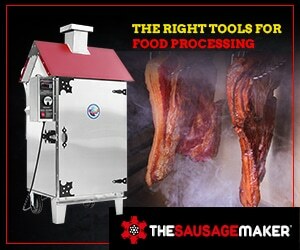 This is important to get the sausage to bind properly. Once it is mixed well, put it back in the fridge. Thanks for the recipe. We had one for the goat sausage before we left Ireland but it seems to have got lost in the move. The best recipe we had before, was from one we aquired at Foxford Goat fair. We will try yours this next week as we have two goats to kill. I have had longaniza a few times here in Northeast Mexico, Monterrey to be more specific, but it is not as common, and it remind us more of chorizo and is more usual in central and southern Mexico. Here what we call longaniza is a mixture of chopped beef fat and meat trimings, lungs and blood with pepper, cumin, garlic and spearmint, inside a cow´s big gut and boiled for a long time or steamed. I suppose it must taste more like haggis. Another dish simmilar would be the patagorria or asadura, a stew made with the heart, lungs, kidneys and liver of beef, deer, sheep, etc.